Companion animals are natural teachers. They help people of all ages learn about responsibility, loyalty, empathy, sharing, and unconditional love—qualities particularly essential to a child’s healthy development. Through helping to care for a pet, children also learn to care for their fellow human beings. A classroom dog is an innovative teaching tool used by social workers, therapists, education and special needs teachers working with children and young adults with physical, emotional and developmental disabilities. The dogs help them teach basic concepts like “up,” “under,” “down.” Children with histories of sexual or physical abuse often need a catalyst to prompt disclosure. A classroom therapy dog, non-judgmental and unconditionally loving, can provide the help necessary to identify children in crisis. Animals in the classroom are amazing. They can bring a renewed inspiration and excitement into the learning process. They can empower our students. Dogs help develop self-esteem, responsibility, motivation, self-discipline and communication skills. The AKC Community Canine and Domesti-PUPS pet therapy certification is expanded for educators who are looking for innovative ways to educate their students. 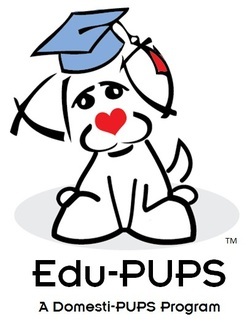 These educators use their certified therapy dogs (Edu-PUPS) in the classroom in a variety of ways such as teaching responsible dog ownership, individual responsibility, respect, and social skills to name a few. These therapy dogs are used in traditional and special student populations, such as assisting children with ADHD focus on their studies. The dogs provide a calming effect and also help with emotional leveling.